I drink beer but I care about the environment. 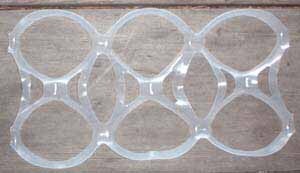 That means I take the time to cut plastic six-pack holders. I don’t want any fishes or small animals to get caught in one. They shouldn’t suffer because I had a cold one. Cutting six-pack holders is a quick and easy way to make Captain Planet proud. It’s up to all of us to save the world. And it’s a lot easier to cut plastic six-pack holders than it is to stop drinking. I did my part. Hope you did the same.